A creamy balm that intensely regenerates and nourishes the skin. When you wake up, the features appear to be refreshed, the skin is luminous and full of vitality. Polyphenols of Vanilla, boosters of Hyaluronic Acid, help fight against sagging skin and give back matter and density to the skin. SytenolTM, a powerful cellular restructuring agent, strengthens cells and helps maintain facial volumes. Glycolol, precursor of essential skin lipids, restores suppleness and comfort to your skin thanks to its immediate and lasting nutritive effect, by reviving the natural synthesis of lipids in the skin. An important nutrient phase, enriched with shea butter, which helps regenerate the skin. Provides the skin with an immediate feeling of comfort thanks to Avène Thermal Spring Water, naturally soothing and anti-irritating. 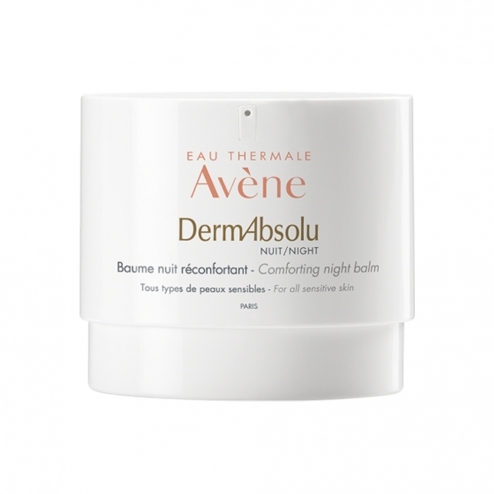 A moisturizing action 24h for a feeling of skin without tightness throughout the night. * TM of Sytheon USA. Apply each evening on the face, neck and décolleté. INCI formula: Avene Thermal Spring Water (Avene Aqua). Caprylic / Capric Triglyceride. Coco-Caprylate / caprate. Glycerin. Butyrospermum Parkii (Shea) Butter (Butyrospermum Parkii Butter). Methyl Gluceth-20. Dimethicone. Behenyl Alcohol. Octyldodecanol. Cetearyl Alcohol. Glyceryl Stearate. Peg-100 Stearate. Glyceryl Linoleate. Aluminum Starch Octenylsuccinate. Ammonium Acryloyldimethyltaurate / Vp Copolymer. Bakuchiol. Simmondsia Chinensis (Jojoba) Seed Oil (Simmondsia Chinensis Seed Oil). Benzoic Acid. Caprylyl Glycol. Cetearyl Glucoside. Dimethicone Crosspolymer. Disodium Edta. Fragrance (Perfume). Glyceryl Linolenate. Glyceryl Oleate. Glyceryl Palmitate. Glycine Soya (Soybean) Oil (Glycine Soja Oil). Helianthus Annuus (Sunflower) Seed Oil (Helianthus Annuus Seed Oil). Hydrogenated Starch Hydrolysate. Propylene glycol. Sodium Hydroxide. Tocopherol. Tocopheryl Glucoside. Vanilla Tahitensis Fruit Extract. Water (Aqua).